Epilepsy is the fourth most common neurological disorder and affects people of all ages. It is a chronic disorder of recurring, unpredictable seizures. A person can be diagnosed with epilepsy if they have two unpredictable seizures. During a seizure, a person experiences abnormal behavior and sensations, sometimes losing consciousness. Many people with epilepsy have more than one type of seizure and may have other symptoms of neurological conditions. Seeing a neurologist and having an MRI scan to look at the brain and EEG to record the electrical activity of the brain is very helpful to diagnose types of seizures. Epilepsy is caused by malfunctioning nerve cell activity in the brain. It may occur as a result of a genetic disorder, brain injury, or a stroke. Any age, gender, and race can be affected. There are an estimated 3.4 million people nationwide that are affected by epilepsy. Having seizures and epilepsy can affect the individual's safety, work, driving, and more. 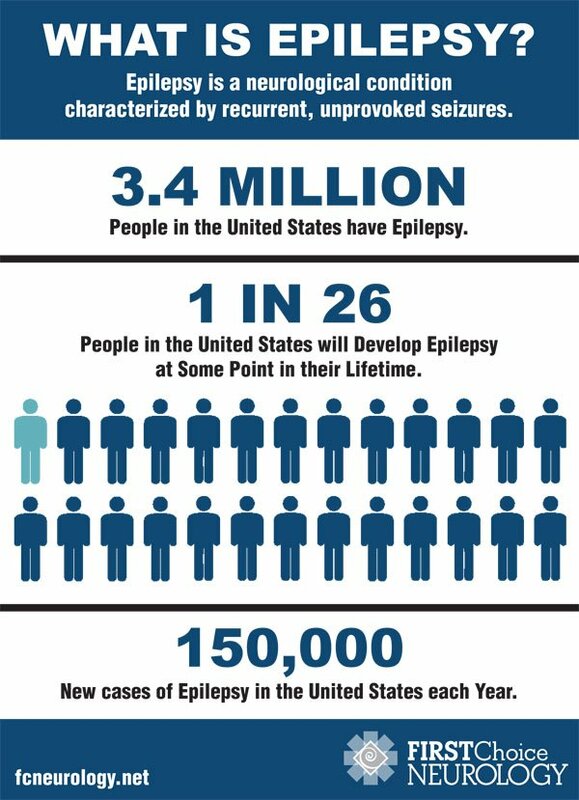 • 3.4 million American adults have epilepsy. • Every year almost 150,000 people in the United States develop epilepsy. • You have a higher chance of developing epilepsy if you have a family history of epilepsy in your family. • The most common causes are a stroke, brain tumor, brain infection or head trauma. Keep track of behaviors - Identify and watch for certain behaviors, environments, or physical and emotional signs that come right before an attack, this can be known as a trigger. Aura - Be aware of a warning "aura". This could be a taste or smell. This may allow you to lie down in time to avoid falling or seriously injuring yourself. Recurring seizures - If you are experiencing recurring seizures, this could be a sign of epilepsy. Is There a Treatment for Epilepsy? Most people with epilepsy find relief from their symptoms with the most common forms of treatment. Treatment might be as simple as taking a medication or require more invasive treatments. It is recommended to see a doctor if you injure yourself during a seizure, having a seizure that lasts longer than 5 minutes and failing to regain consciousness or breathe after the seizure is over. Read more about epilepsy treatment options.